The three-year-old boy stood on the WW2-era grenade while searching for chocolate in Somerset. 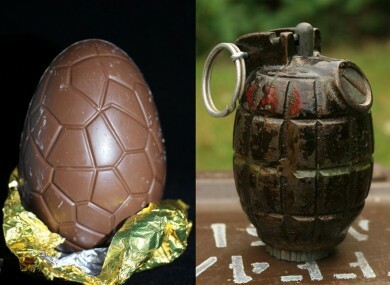 Easter eggs and grenades: not good substitutes. ARMY BOMB DISPOSAL specialists had to be called to an Easter egg hunt in the sleepy south of England over the weekend after a three-year-old boy stood on an unexploded hand grenade. The festive egg search was organised by a pre-school in Somerset and attended by around 25 families. All was going well until local father Stuart Moffatt spotted that one toddler was standing on the World War Two-era munition. I saw a young boy, around three-years-old, standing on an object. On closer inspection we realised it looked like a hand grenade. It was brown and about three or four inches high. It looked like an Easter Egg. According to ITV News, parents managed to slowly move the children away from the scene. The device was later destroyed in a controlled explosion. It’s not known whether the incident affected the children’s Easter chocolate supplies. Email “Toddler on Easter egg hunt finds hand grenade”. Feedback on “Toddler on Easter egg hunt finds hand grenade”.